You may have been sending emails for years now, but sending emails and getting them to be actually opened and read are two completely different things. Do you write your emails or newsletters with a goal in mind? Do you set clear targets writing to your clients? Do you monitor open rates or responses? Here are 5 simple tips to help kick start your email marketing programme and get those emails open, read and responded to in 2014. Not all your emails have chances of being opened. How can you boost the chances of your email being actually opened and read? Work on your subject line. Make them short, interesting and catchy. Throw in compelling information that will not be easily ignored. Make it as specific as you can. You only have a few words to use so use them wisely. Try to sound personal in your emails. When you write, always write your email to just one customer or client. Speak in a friendly and warm tone. Portray yourself as a person who can be connected with easily. Don’t sound distant and cold! Don’t try to sound like it is another mass email sent to your 2000 clients email list. 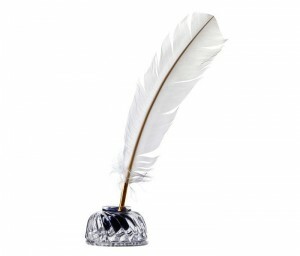 Write personally, and receive a personal response! Whatever the subject of your email is, try to be as brief as possible. Your contacts are busy people and they don’t have enough time to carefully read through long drawn-out emails where you’re writing the email to inform them about your next webinar and it detours to how much you value your new car! Have a clear call to action in your email. Write with a goal in mind. Decide exactly what you want the reader to do, and show them the action you want them to take. Whether you are offering a free download or it’s a free voucher coupon, make it easy for the reader to see what you want them to do, and encourage them to do it! Collecting subscriptions using a third party software will help you control your email marketing lists, and will help you monitor your open rates and responses. Online solutions such as Aweber and Mailchimp allow you more control over your lists, helping you create a more targeted email marketing experience for your database. Your email marketing directly affects your business; Mastering best practices of writing emails and ensuring they are read will help you achieve your marketing goals and increase your direct response rates. Always wanted to write a truly magnetic Blog post? The article readers come back for, time after time? Getting traffic to your website is only part of the recipe for business success. Essentially, there are many ingredients which count towards making your business website the connoisseur of the industry. My article How to get original blog content in 10 minutes helps with writers block and creating your posts, but what is the real secret recipe for business writing? Aim to make a ‘Golden’ piece of content, for sure, but to really make your site stand over and above others, it’s a great idea to follow a ‘recipe’ building the essential ingredients of a killer post or article, ensuring your readers really get value from their visit and return for more. Useful, well written content, along with persuasive sub-headlines and targeted information gives your website visitors a real reason to stay and browse around. Copyblogger have created this fantastic infographic (see below) mapping out the 11 essential ingredients of writing a blog post, however you can apply the format for any kind of business writing, no matter what industry you are writing for. So, what are these ingredients? Really identify with your readers. Make sure your content delivers what your readers really want and need. Endless posts of the same old ocntent are utterly worthless, especially when your competitors are crafting and delivering the same. Your customers choice will be one of convenience, not of desire. And we know that desire often outsrips the regular choice of getting it on your doorstep. Less is so often More. Making sure you have all the ingredients will improve your audience, readership, bounce rates, and of course popularity, as your stunningly crafted articles and posts become firm favourites with your customers. Enjoy the prospect of crafting the most superb articles you have ever written! 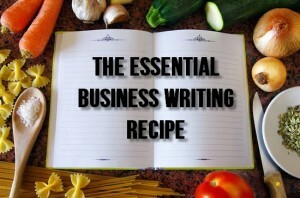 Please share your secret recipes for business writing in the comments below. What companies have suitable positions for your skillset and who to target. Sounds amazing? It sure is. The good news is, LinkedIn has all these resources available for you to use, for free, via their LinkedIn Skills and Expertise Page. 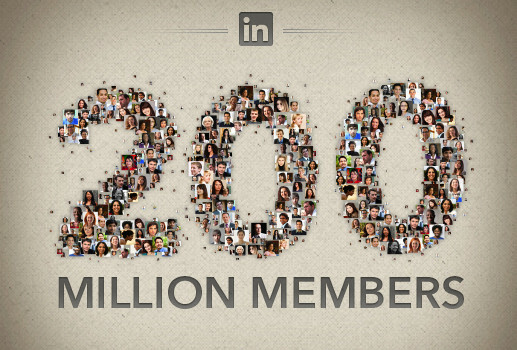 With over 200 million members, LinkedIn is connecting professionals and companies around the globe. So how can you tap in to this excellent resource and enhance your own business networking? 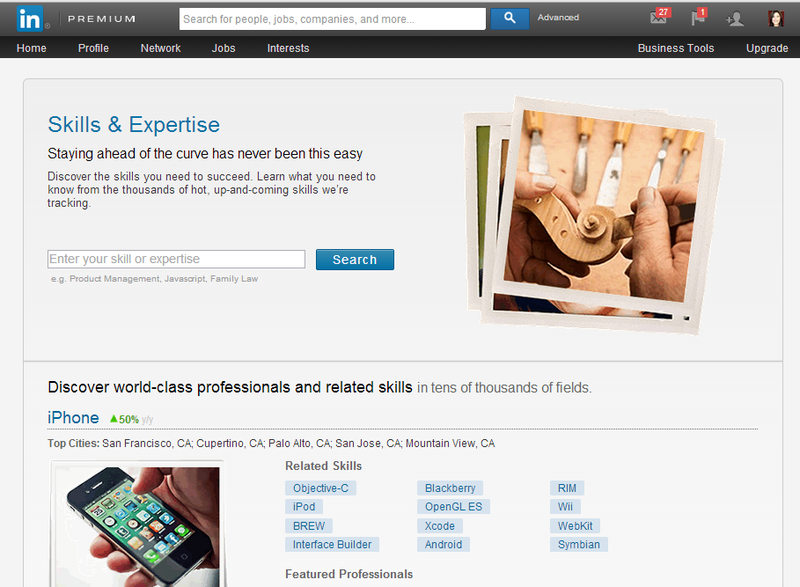 When the page loads, LinkedIn provides you with some trending skills and insutries – in this example, it has brought up iPhone as up by 50% y/y (year on year) along with related skills for the industry and featured professionals. In the box provided, you are asked to enter your skill or area of expertise. I am using Social Media Marketing for this example. Let’s look at what comes up after you search. On the left hand side, you will see a column titled ‘Related skills’ Treat the words that appear below as targeted keywords to your field. You can click each keyword and browse the description of the skill, and also investigate the top profiles associated with that area. 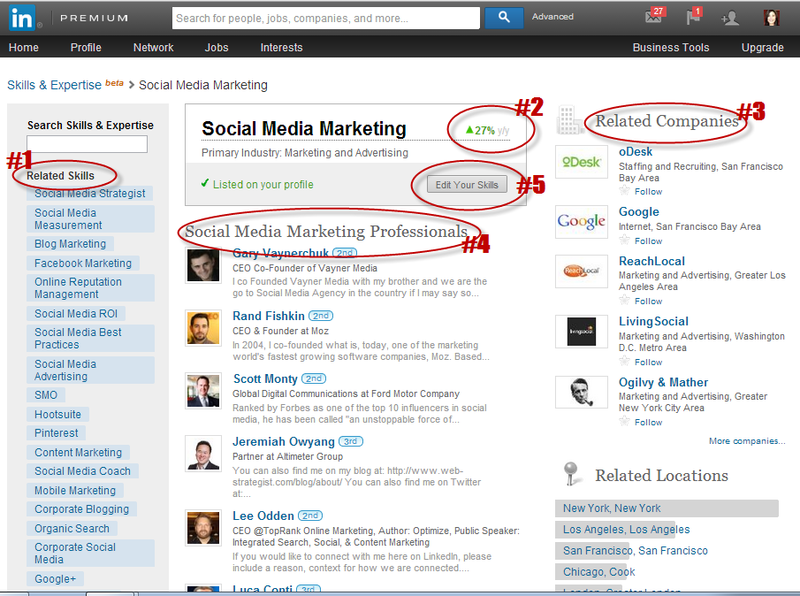 You can see that social media marketing as a skill or area of expertise is up by 27% on a year on year comparison. This can be a good sign that your chosen field is on the upward trend, and popular. It can also mean that there is plenty of competition! These are the companies that influencers and other LinkedIn members are following or a part of. You can investigate and research these companies or follow them to stay on top of news and updates in your industry. You can click on each company and see what positions or opportunities are available there, and details of their latest updates and any discussions within those updates. This section shows you top influences and professionals in your chosen field of expertise or industry. This is where you can begin the networking! If they’re a first-degree connection, send a personal message, For a second degree connection, when you click their profile, you can follow or connect with them, asking for an introduction. If the profiles listed appear outside your immediate LinkedIn network, you could join a shared group and connect with them there or if you have a premium account, you could send them an InMail. When you click this button, you can add important skills from the related keywords LinkedIn has provided you with, ensuring your profile is optimized for the most related skills and expertise in your field. Help other people and companies find and connect with you by using keywords that are being searched for! When you scroll further down the page, you will see related groups that members of your profession have joined. You can find targeted groups to join, and also how may members each group has. So there you have it. 5 minutes to a laser targeted LinkedIn profile. With the latest statistics, facts and figures from LinkedIn, it makes Facebook business networking look like a childrens tea party….I hope you enjoyed the post. Let me know if you are using LinkedIn to its fullest capacity yet or share the results of your efforts below. 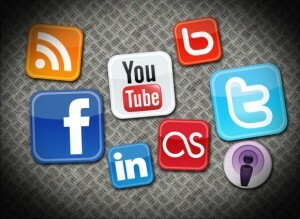 Social media can greatly boost your business. By developing a solid strategy for all the different social media platforms like Facebook, Twitter, Pinterest, LinkedIn, YouTube etc. you can enormously increase the odds of getting new customers to your business. However, in the blind race to secure a high place on social media many small and medium business owners, in fear of being left behind their competitors, have thrown their profiles on these different platforms without a clear strategy or goal. These carelessly placed-in-haste social profiles are prone to lose them business instead of boosting it. These are 5 mistakes that you need to pinpoint in your business profile and put an end to if you want to really have an impact. In the blind race to secure a place for their business many people have put together social media profiles in haste that are unprofessional. They are incomplete and they lack the essential coherence that a brand needs. These kind of profiles are more likely to convey a negative impression than to give a positive one. If you own such profile(s) complete it now. Come up with one that is complete with all the required details and images. Then devise a strategy for it. Then there are all those profiles that are complete and professional in the above sense but they are deserted places! You go there and you don’t find any new activity for weeks – even months. These are more likely to do damage than good as in case 1 because it conveys a sense of lack of interest. Remember to always keep your social profiles up-to-date with fresh and original content in your niche. It will keep visitors coming back for more fresh content. Getting people to comment on your content is one of the primary reasons for writing and sharing content. However, it is seen that sometimes people don’t seem to respond to visitor’s comments in a timely manner. This can be particularly frustrating to your readers, especially when they find it very hard to take out the time to comment. This can lead them into thinking they are unimportant in your eyes and they might turn their back on you as well! It is also important to have a proper strategy for all the social media platforms in place. 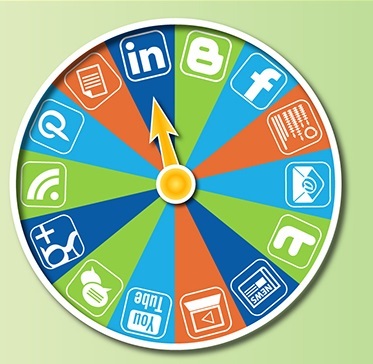 It is important to know that different social media platforms have different target audience. You need to be able to have a balanced approach to tackling all of them in a systematized manner. It is not wise to establish a strong presence on one platform and ignore others altogether. Remember it all works as a whole. You need to tie the knots to make yourself visible to the crowd. Another mistake that you might be making on social platforms is not combining the right kind of content for an optimal impact. You need to employ a content strategy where you provide visitors with a mix of text, images and videos. By providing such a variety of content you are able to keep the visitors to your page hooked to make them come again and again for new content. Having this kind of social media platform also shows a higher level of professionalism on the part of the page owner. If you are making any or all of these mistakes it is time to rethink your overall social media strategy and tackle the problem areas. If you get rid of all these problem areas you will have a greater social media followership and a greater business. Blogging is both fun and exciting but it can become a tiring and time-consuming process at times while trying to offer a unique and interesting experience to your audience; however, it can be made much simpler and easier by using some blogging tools that have been created specifically for bloggers. Below I have collected some of the top blogging tools available from the internet. Diigo is a social bookmarking site that allows you to bookmark and tag web pages. It is a great tool for all those bloggers who need to keep track of their desired articles for later reference. Not only that you are also able to add notes to your bookmarked content. It also supports mobile phone devices such as iphone, ipad etc. Disqus is one of the most powerful blogging tools. It provides you with everything you need to build a community around your blog, and to maintain a powerful commenting system with a much better threading in the latest version than in the older one. It also allows you to up-vote and down-vote comments. The posts and comments are connected with each other in a neat and clean manner; also, you can place related articles at the bottom of a post and have a look at the top commenters at a glance. Focus Booster is a tool that is used by many bloggers to gain focus and increase their productivity. They have both a desktop and a web application available. Based on the principles of the pomodoro technique , the application provides a simple timer with a sleek design to enhance your concentration and focus. The principle behind the tool – the pomodoro principle – “uses a timer to break down periods of work into 25-minute intervals (referred to as “pomodoros”) separated by breaks and is based on the idea that frequent breaks can improve mental agility”. Alltop lets you in on what is happening around you by collecting headlines from top sites and headlines. The site provides an insight into all the topics which can be of interest to us – all in one place. Trapit is “the world’s most advanced personalized content discovery application” – as they call themselves. The app lets you set up “traps” for various topics – from very broad categories to niche information – and then it aggregates articles related to your selected keywords from around the web. Trapit “learns” from your explicit and implicit actions in order to deliver the most relevant content. Photo Pin is a source of free images for your blog; the photos come from creative commons. The tool makes it very easy to browse photos and to download them in multiple sizes. One of the cool features of the app is that it gives you the attribution link to the image in HTML so that you can insert it into your blogging editor for attribution. One of the most important aspect of blogging is to keep your audience engaged and to understand their interests. As a blogger you need to get insights into what your target is talking about. PopSurvey is a great survey that lets you carry on surveys on your blog to help you better understand your customers. The tool also provides you with custom reports to help you understand and evaluate your audience’s responses. After The Deadline is a great tool that helps you avoid grammar and spelling mistakes. 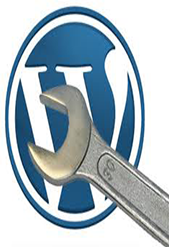 It is available as a browser extension as well as a WordPress plugin. It is a great language checker for the web that comes with contextual spell checking, advanced style checking and intelligent grammar checking. Say goodbye to all those ‘arghhhhhh’ moments when you see that you have made a mistake after you have published your blog post! The Google Keyword Tool is a must for every blogger and their mother! It lets you enter search phrases and lets you see how much traffic that particular phrase gets for over a month. Also it gives suggestions on better search phrases based on the keywords that you have entered. Are you a blogger? Are there any tools you are using that you would like to share? Further to my previous post about content marketing, I found this great infographic containing some really useful help and information for any business embarking on their first content marketing campaign. As discussed before, content marketing is the ‘ongoing promotion of a business or brand’ and this guide helps define the strategy needed for a successful content marketing campaign. The golden nugget that I have taken from the guide is; START ANYWHERE. There is no specific starting point, and no single point is better than any other for your business. Covering many different types of content marketing such as press releases, articles, webinars, email marketing campaigns, useful infographics and videos, it gives useful tips about how to re-purpose and share your content across various social media platforms, to engage and build your audience. Helpful with SEO and building an audience, producing content for various channels will assist any successful brand marketing campaign and will ultimately help spread the word about your business and engage your potential customers. You run a baby products store that also has an e-commerce site. You place an online ad for your business and a print ad in the local newspaper. 1,000 potential customers see your ad. These customers haven’t visited your store before, and have no idea about your company or your brand. They are not sure whether you are a trustworthy company, and are not really bothered about popping into your store. They check your website, look at your products and leave. 5 customers decide to pop in and 5 customers decide to visit your website. Of those 10 customers, 2 decide to make a small purchase. You run a baby products store that also has an e-commerce site. You produce a series of free ‘how to’ baby guides, and write a regular email newsletter about the latest product reviews and mother baby news. You never ask for a sale upfront; instead you produce lots of useful, helpful content on your company blog, including an interesting article about how to save money on pushchairs which the local paper decide to publish, along with a link back to your website. Your newsletter sign up is available on your website, many people who followed the link sign up, and you give your subscribers an exclusive discount code to use on your website. They love your helpful guides and articles, and each month, around 20% of your subscribers make a purchase, in addition, customers who read your article get in touch, visit your website and subscribe and then use their discount code. you make a minimum of 20 new purchases. You also get contacted by a local magazine to write another baby related article on the latest baby products and toys who will also publish your website link and your store details. Did you spot the difference in the two scenarios above? I hope you can see how effective content marketing can be to help funnel potential customers into your sales funnel, and are thinking of hundreds of ways of reaching out to your potential audience. Did you find this useful? What types of content marketing work for your business? Are you setting up your first campaign? Please leave a comment below with your own tips or opinions. Why is content marketing the alpha strategy for businesses and marketers? Traditional publicity and marketing is a static way of capturing the attention of potential customers, and promoting your products or services. It isn’t engaging, it isn’t viral and the costs quite often outweigh the results. Content marketing is a cost effective marketing strategy that all successful businesses need to adapt. Be there or be buried in the swamp of static websites, unknown retail stores and other, struggling businesses and brands. So, ‘WHAT’ is content marketing? Put simply, it is taking information pertaining to your industry, niche or brand, and turning it into useful material, suitable for your audience, the consumer and brand definition. How we ‘DO’ content marketing? We create a variety of different media, which can be distributed through various channels and platforms, both online and offline. We create engaging content such as blogs, articles, videos, animations, images, viral photos, downloadable guides and podcasts (mp3 recordings) and we share and distribute them to engage our audience. We provide value in our content, encouraging end users to share and engage with our business. Should we ‘DITCH’ traditional publicity and advertising? Of course not! I would never suggest for one minute that local businesses and offline businesses should ditch the traditional advertising route. Instead, every business must learn to adapt new strategies and incorporate traditional marketing into their advertising campaign where it is affordable and offers the most value. 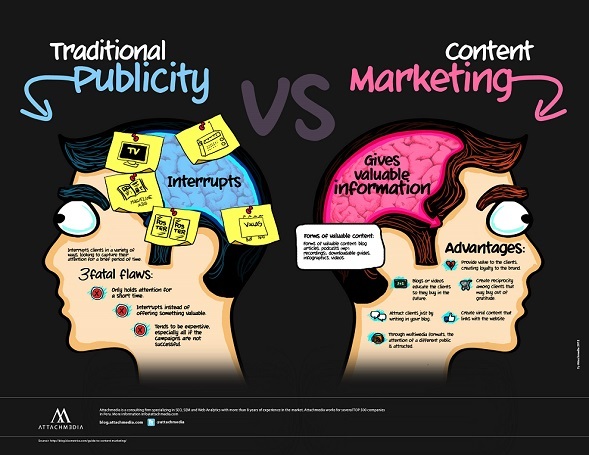 The Traditional Publicity VS Content Marketing infographic below offers a simple explanation of why content marketing is the alpha strategy for businesses to incorporate in their campagins. When Facebook was rolled out, nobody had any idea that it would eventually incorporate an excellent marketing tool for businesses. Today there are millions of registered business pages on Facebook, all representing their brand. Below I have outlined 25 tips to help you manage a successful Facebook business page. 1. Email your existing contacts to inform them that you have a Facebook fan page and to ask them to “Like” it. Make things easier for them by sending the URL of the page in your email. Also, ask them an extra favour of recommending your page to their friends. 2. Your Facebook cover image is the first thing your page visitors will notice. Your cover image should tell the visitor all about your business and they should understand clearly at a glance what your business is all about. 3. Instead of going after your personal page you need to sport a Facebook fan page design that reflects the nature of your services/product. For example, if you are in the property business your page will need to look corporate and professional. 4. Use Facebook scheduled posts feature to send regular updates to your profile. Whatever you choose to share – image, video, status update etc. – Facebook lets you choose the exact time it will go live. The tool saves you time, but don’t forget to visit your page to follow up and answer any comments posted by followers. 5. Increase your fanpage “Likes”. Go to the top of your business page and click where it says “Build Audience” and then click “Invite Friends”. Invite all of your friends to your page who are likely to be interested in your service or product. 6. You may not be the only person who manages your Facebook fan page. Rather than sharing a Facebook account with others you can authorize other people as administrators. Just click “Edit Page” at the top and from there click “Manage Admin Roles” and follow the steps to add multiple admins. Now you can adjust timings with other admins to manage your page seamlessly. 7. You can get “Recommendations” for your business which can benefit you highly. However, to make the recommendations available you need to provide the exact location of your business in the “About” section. 8. Your Facebook fan page should act like your “Facebook blog”. Share original content – comments, images, videos etc. – to keep the stream active. If don’t post regularly your subscribers will eventually ‘unlike’ your fanpage, thinking it is dormant. 9. Because the main purpose of your Facebook fan page is to convert visitors to fans, make sure your timeline cover photo image is eye catching enough, and ensure the ‘About’ section is completed, so people know exactly what your business is about. 10. Facebook gives you the ability to target your ad campaigns by gender, educational status, relationship status, age, location, interested in and language. This allows you to target a campaign at a particular group of fans. Be sure to research your demographics thoroughly before creating a campaign. 11. Facebook gives businesses the ability to collect data from users in a fun and smooth way. You can have fans to your page sign up for a direct newsletter through an app or you can offer them a promotion where they are required to answer a few questions before they enter. Be sure to search for available apps for business pages. 12. When you first create your page, Facebook offers a standard set of tabs like the Wall and the Info tabs. You can extend the capability of your page greatly by creating some custom tabs in addition to the default tabs. 13. Facebook gives page administrators the ability to send their fans updates. When you have something of value to share with your fans send them an update to let them know about it. However, you should be careful with updates: do it when you have something really worthwhile to share. 14. Entice prospective audience into joining your page by offering something of value. It can be an eBook, entrance into a contest, or a free coupon. This way you can have more prospective customers connected with your business. 15. Make sure that a vanity URL is available for your business. It should be something simple and easy to remember. 16. Find out what content your fans engage with the most and when to post it on Facebook. There is a third-party application – EdgeRank Checker – that you can use to do that. This application will determine for your page the most effective day of the week to post on, popular keywords, the most suitable type of media for your audience and how often to post. 17. Encourage people to comment on your page. This also means that you must connect with the people who are commenting on your page by responding to they say regularly. If you don’t reply, engage and comment back, people will feel ignored and they won’t engage or get in touch in the future. 18. When it comes to posting, pictures and videos are unmatched in engaging visitors. Share interesting and useful pictures and videos related to your business. You can also tag top posting fans or new fans in these to send them a notification whenever you post. 19. Promote your Facebook page through different media platforms. Provide your Facebook page URL on your business card, include it in your email signature, add a Facebook “Like” button to your website etc. 20. Use “Facebook Insights” to learn more about the people who like your page. Based on their specific Facebook behaviour you can tailor posts and offers to match their specific needs. 21. Offer exclusive content to visitors but require them to first “Like” your page before they have access to the valuable content. This exclusivity will more often than not entice people into liking your page and getting hold of that valuable content. You may need to use an app for this feature. 22. Engage your followers by running polls on your page with the standard Facebook “Questions” feature. 23. Update your Facebook page with your blog post as soon as it is published – share the link and post it as a status update. 24. Join Facebook groups related to your niche. Post to these groups in order to drive traffic to your own page and website. 25. Post your YouTube videos to your Facebook page stream. This is another channel to build credibility and get more people to like your page. Did you enjoy these tips? Do you have any more Facebook tips to share or any case studies? Whats working for your business page right now? Feel free to share below. For business startups with limited budget creating a high-impact marketing can be a tough and demanding job. Traditional marketing like radio and newspaper ads, brochures and banners will instantly eat into your marketing budget. The good news is, it is possible to introduce a killer marketing campaign at a very low cost! #1 You can repeat these low-cost marketing strategies over and over to get your company message and brand image across to potential customers (which affects buyers’ decisions enormously). It is effective and it won’t cost you an arm and a leg! #2 You can direct a low-budget marketing plan into several marketing channels as opposed to traditional marketing mediums. For example, the money that you would spend on a single newspaper ad campaign can be spent on email marketing, social media and your business website combined, to create a larger, more sustained campaign. #3 With this kind of business marketing plan you can test your campaigns relatively cheaply and stop spending money on a medium once you see that it is not effective. You can experiment with different channels and choose the one that best suits your business. Probably the most important part of your marketing plan is finding the right target customer for your business. What you need to do is to split your target market into easily identifiable chunks and then carry out your marketing plan accordingly. For example; If you are setting up a personal training company in your local area, find conversations on Twitter, local groups on Facebook, LinkedIn Groups and local Forums, and find out the cost of placing a banner ad on the site or get involved in the group conversations and message boards as a helpful expert in your niche. It doesn’t always have to cost thousands! 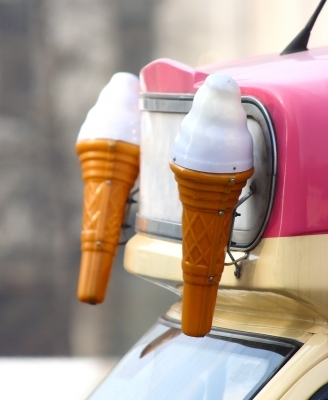 Low cost guerrilla marketing tactics are often a great success and can propel a company image overnight. For those who haven’t heard the term before, guerrilla marketing is a kind of advertising strategy in which un-conventional means are used to promote a product or service. Guerrilla marketing is different to traditional marketing in that it mostly relies on personal interaction and word-of-mouth. You can focus on smaller, more targeted groups to spread the word instead of large-scale media marketing campaigns. Think outside the box for example; you could introduce a viral YouTube video to be shared across the social media sites, you could ask for customer participation or customer video responses. Maybe ask a public question where people post images of themselves with your product. Another surefire way to reach new customers is by a system of business referrals. This method is cost effective and proven to increase sales. Word-of-mouth is a powerful tool when it comes to people making decision about buying a product or service. One satisfied customer telling others about your product can do far better than any advertising campaign. Offer an incentive to refer your next sale; you could give a free gift, a discount or some other reward, specific to your business. You could partner up with another business and help to promote each others services. For example, if you are running a restaurant you could offer local businesses discount coupons or free items from the menu in return for advertising space on their premises. Again, what you offer and what you get in return will vary, so be sure to contact businesses that you believe your potential customers will be frequenting. A great way of building credibility and helping spread the word about your services is to offer free seminars, webinars or lectures which focus on building awareness about your niche. This will help place you as an authority in prospective clients’ minds. Find local pubs, bars, restaurants or function rooms – many will let you have a space free of charge if you can guarantee a set number of attendees, as they will purchase food and/or drink on the premises. You could start a regular free Meetup for people to attend, to help build your business brand. As you dig deeper into marketing for your small business you will explore more and more inexpensive strategies. Before you launch any business marketing campaign, take some time to think ‘outside the box’ and brainstorm ways of using some of the powerful free social media and other online channels in your strategy. Feel free to add your ideas below or share some successful business marketing campaigns you have created on a budget.